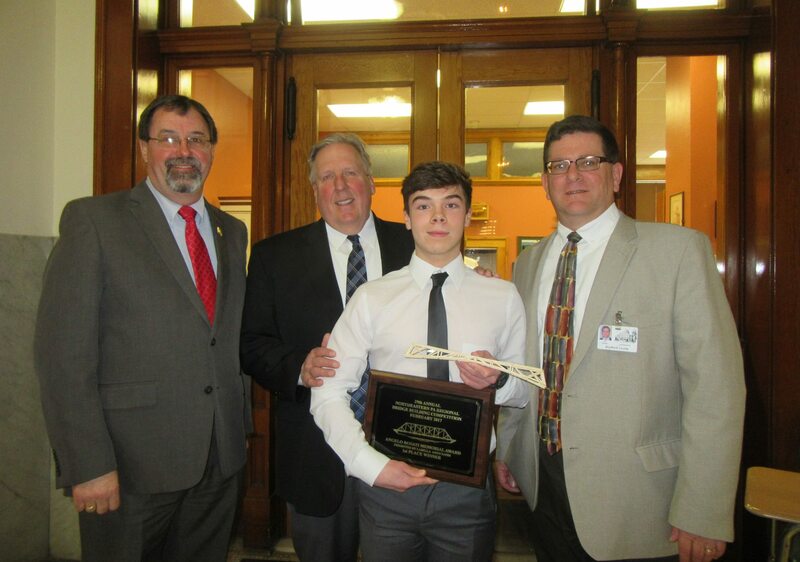 North Rome Christian School junior Joe Maenza (center) with Bradford County Commissioners (from left) Daryl Miller, Doug McLinko, and Ed Bustin recently took first place in the “Efficiency” category at the Northeast PA Regional Bridge Competition held on Feb. 11 in Dickson City. 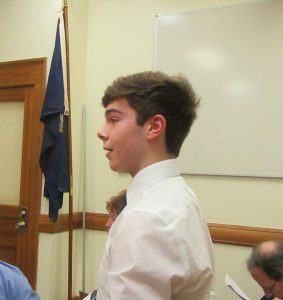 Joe Maenza was one of three North Rome Christian School (NRCS) students to take home trophies from the Northeast Regional Bridge Competition this year. The object of the contest is to see who can design, construct, and test the most efficient bridge within specific guidelines. Joe, a junior, took first place in the Efficiency round when his 10-gram bass wood bridge held 12,877 grams – an efficiency rating of 1,191. 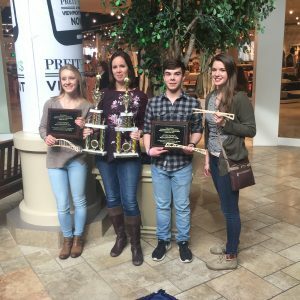 High school students from 20 counties were eligible for the competition, which took place on Feb. 11. NRCS science teacher Elizabeth VanDerpool was proud to bring home three winners. In addition to Joe, senior Alicia Lykens won first place for Excellence in Architecture and placed 14th overall in efficiency testing. Senior Cali Jennings took 15th overall in efficiency. Alas, only the top two winners in the Efficiency category in the regional competition are invited to move on to the International Competition in Dallas, TX, which will be held on April 21. Joe, who resides in Sayre, will be improving and rebuilding his original bridge design for the competition and is currently trying to raise money for traveling expenses for the trip to Dallas. Joe addressed the Bradford County Commissioners at their regular public meeting on Feb. 23 (above) with his model and plaque in hand. He credited VanDerpool, whose husband is an engineer, for her guidance. “I look up to her a lot,” Joe remarked. Commissioner Doug McLinko invited him to come back after the international meet to let them know how he does. McLinko also noted that Bradford County owns 52 bridges and welcomed Joe to become involved in their ongoing maintenance. Readers who would like to assist Joe in his endeavors, please send charitable donations to North Rome Christian School, c/o Josiah Maenza, 3376 N. Rome Rd., Rome, PA 18837. 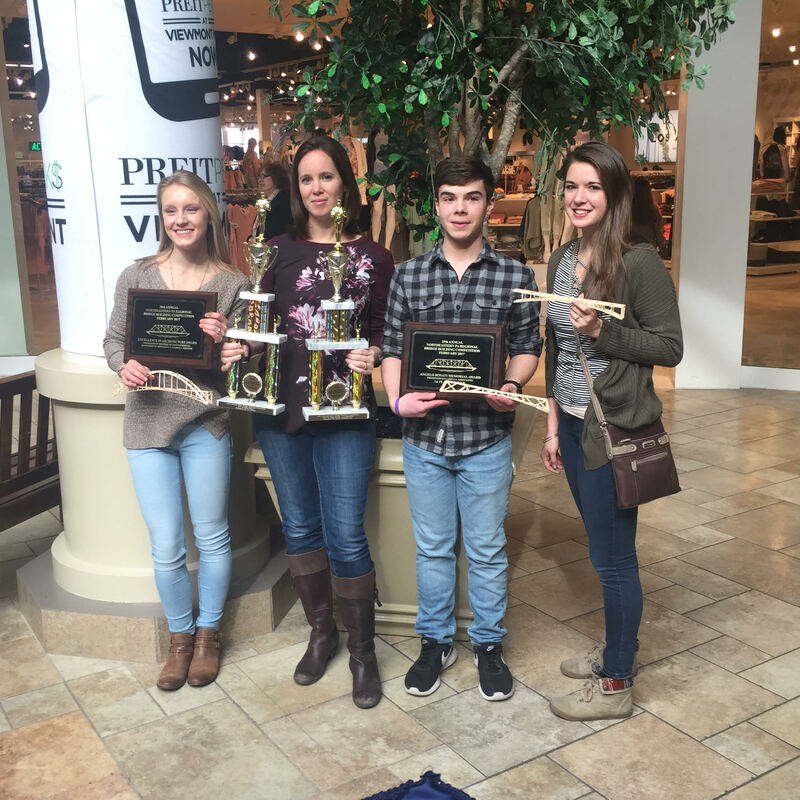 All smiles after their successful competition at the Viewmont Mall in Dickson City on Feb. 11 are (from left) NRCS senior Alcia Lykens, sience teacher Elizabeth VanDerpool, junior Joe Maenza, and Cali Jennings.